Machu Picchu, Christ the Redeemer, Iguazu Falls… the unique wonders of South America are yours to discover on this 22-day journey through five sensational countries. From the exotic streets of Rio de Janeiro to the ancient Inca capital of Cusco and beyond, this is the trip you were destined to take. Begin your cultural odyssey in beautiful Buenos Aires, the home of the tango, and discover some of its most famous sights such as Colon Theatre and Congress Square. Leave the big city behind with a visit to the UNESCO-listed town of Colonia Del Sacramento, just a one-hour ferry ride across the Rio de la Plata. 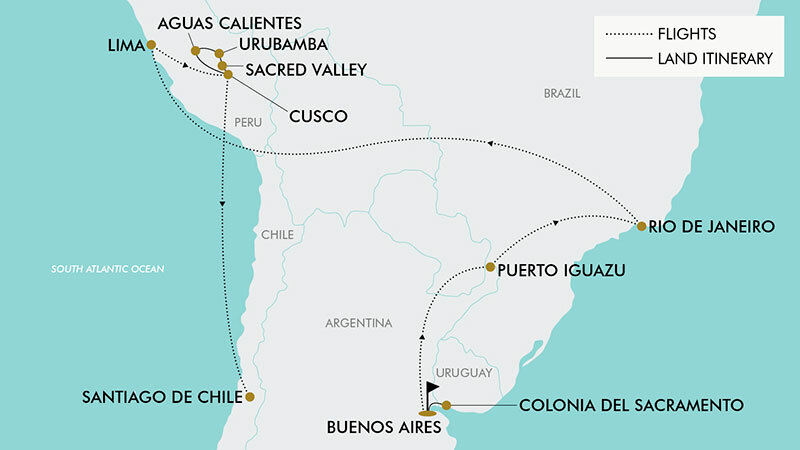 Travel to both the Brazilian and Argentinian sides of Iguazu Falls, the world’s largest waterfall system; ride the cablecar to the top of Sugarloaf Mountain in Rio de Janeiro on a half day city tour; take in the historic cities of Lima and Cusco on tour; visit Machu Picchu, the once-forgotten 15th century citadel hidden high in the Andes Mountains; travel through the Sacred Valley; see the sights of Santiago on tour and much more! This comprehensive tour includes return international flights, five additional flights, 19 nights quality hotel accommodation, English speaking guides and more. Want to experience even more? Optional excursions to the magical Angra Dos Reis Islands of Brazil, the scenic Palomino Islands of Peru, and a folklore dinner and show in Cusco are also available. Today depart from Auckland for Buenos Aires. Fly with Latam Airlines, Qantas Airways or Air New Zealand (subject to availability). Upon arrival into Buenos Aires be welcomed and transferred to the hotel. Today discover the magic of Buenos Aires! After breakfast enjoy a three-hour city bus tour, seeing the beautiful parks and gardens of Recoleta and Palermo neighbourhoods, the Colon Theatre, Mayo Square, The Cathedral, traditional Mayo Avenue, Congress Square and many other buildings and palaces (entrances not included). The tour continues with a visit to San Telmo, the residence of the aristocracy until the end of the 19th century. Afterwards you will have the opportunity to explore Caminito Street in La Boca. The tour bus will drop you in Central Buenos Aires where you may enjoy an afternoon exploring this vibrant city at leisure, or transfer to the hotel (transfer not included). Around 8pm this evening you will be collected from the hotel and transferred to a “Tanguería” (Tango House) in the San Telmo neighbourhood, the birthplace of tango and one of the oldest barrios (neighbourhoods) of Buenos Aires. Arrive at a Conventillo, a historic tenement restored and now a restaurant/theatre, where La Ventana takes place. Kick off the night with a delicious three-course dinner and enjoy live tango and folk bands, a gaucho demonstration and a moving tribute to Eva Perón. After the show, you will be transferred back to the hotel around midnight. Today discover the UNESCO-listed Uruguayan town of Colonia del Sacramento on this day trip from Buenos Aires. Leave the cosmopolitan capital behind for the slower pace of life on the other side of the Rio de la Plata. After a ferry ride (approx. 1 hour), meet a local guide for a walking tour of Colonia. Pause for a meal at your choice of restaurant (not included), then spend the afternoon at leisure discovering Colonia on your own at leisure. Return to Buenos Aires by ferry at the end of the day. Please note: You will be required to present your passport upon arrival into Uruguay and upon return to Argentina. After breakfast at the hotel be transferred to the airport for the flight to Puerto Iguazu (approx. 2 hours), the small town close to the spectacular Iguazu Falls. Upon arrival be met and transferred to the hotel. After breakfast, be met by the local guide for an excursion into the Iguazu National Park (Argentinian side) to spend the day exploring the falls and the surrounding rivers and jungle. The park consists of various trails that take you through the jungle onto wooden walkways built a few metres above the jungle floor and waterways. These raised platforms protect the natural habitat of the jungle wildlife and will give you some spectacular views. Enjoy lunch at one of the restaurants in the park (not included) or bring a packed lunch with you from Puerto Iguazu to enjoy in the great outdoors. Return to Puerto Iguazu in the afternoon. This morning after breakfast you will be met at the hotel and transferred onwards to the Brazilian side of the Iguazu National Park. Enjoy a half-day guided tour of the the Iguazu River Canyon, the Salto Rivadavia, Three Musketeers and the Devil's Throat among other iconic landmarks on this side of the national park. This wonderful setting is further enhanced by the permanent formation of rainbows that are generated by the spray from the waterfalls. Enjoy lunch at one of the park’s restaurants (not included) and afterwards transfer onwards to the airport in Foz de Iguazu (Brazil) for your connecting flight to Rio De Janeiro (approx. 2 hours). Upon arrival you will be met and transferred to the hotel. After breakfast you will be picked up from the hotel for a visit to downtown Rio de Janeiro. Visit the Sambadrome, Praca XV, Cinelandia, Maracana Stadium and the Metropolitan Cathedral (entrances not included). Continue onwards to Sugarloaf Mountain ascending by cable car where you can enjoy the amazing views from the top of the famous mountain including the iconic Christ the Redeemer statue in the distance. Afterwards, return to the hotel for an evening at leisure. Today enjoy a free day to explore this vibrant city at leisure or alternatively take part in a day tour to the Angra Dos Reis Islands for a boat tour. Today you will be picked up from the hotel and transferred to a nearby port to begin a journey to the beautiful Angra dos Reis region (approx. 170 km). Angra dos Reis is a Brazilian municipality comprising of 365 islands surrounded by steep, forested coastline and amazing golden sand beaches. Embark on a boat ride (approx. 4 hours) through the beautiful Lagoa Azul and Praia de Araça located on the Ilha Grande. Enjoy lunch on the boat whilst anchored in a beautiful bay (drinks not included). Return to port and transfer back to the hotel and enjoy the rest of the day at leisure. After breakfast you will be collected from the hotel and transferred to the airport for your onwards flight to Lima, Peru. Please note some flights may travel via Sao Paulo. Upon arrival into Lima you will be met and transferred to the hotel. This morning, you will be picked up from the hotel and transferred to the Yacht Club of Callao, approximately 1 hour away. From there, set sail for the Palomino Islands, passing by the San Lorenzo Island, an important part of the history of Lima, the island is only eight miles long but the largest in Peru. Arrive at the Palomino Islands, where you’ll be surrounded by colonies of sea lions, Humboldt penguins and sea birds. Back on dry land, enjoy lunch in the fashionable Miraflores before returning to the hotel. This morning you will be picked up from the hotel and transferred to the airport for your flight to Cusco. Be met upon arrival at Cusco Airport and transferred to the hotel in the centre of the city. Take the remainder of the day to explore this beautiful city at your own pace. This morning you will be picked up from the hotel to begin your half day city tour. First you will visit the exquisite "Koricancha" Temple. Continue onto the Main Cathedral (entry not included), a marvel of religious art home to approximately 300 paintings from the Cusqueña School. Afterwards, travel to the archaeological complex of Saqsayhuamán. You will see the labyrinth of Q’enqo, which is a religious centre dedicated to the adoration of the Earth, and Puca Pucara (reddish place) - previously used as a military control centre. Complete the tour at Tambomachay (Temple of the Water), an Inca site which consists of a series of aqueducts, canals and waterfalls that run through the terraced rocks (entry not included). Afterwards you will be transferred back to the hotel for an evening of leisure. This morning you will travel from Cusco, past Saqsaywaman over the mountains towards the Sacred Valley. Here you will descend 1500 feet to the valley floor, and find yourselves by the sacred Urubamba River and the village of Pisac (approx. 1 hour). In Pisac, enjoy a quick visit to a traditional artisan market, where you can browse and buy some local souvenirs if desired. For those who would prefer to spend more time in the market instead of visiting the ruins, please advise your guide so they can organise a time and place to collect you when returning past the market. Afterwards continue onwards to Urubamba (approx. 1 hour), where you will make a stop for lunch (not included). A short drive onwards is Ollantaytambo, which is surrounded by the sacred mountains. Here, you will enjoy further exposure to Incan constructions, mainly the amazing temple of the sun, enormous blocks of rock perfectly carved, stone water fountains, stairs and terraces. See the beauty of the local people in their traditional dress. Afterwards, return to Urubamba where you will check into the hotel. After an early breakfast, a local guide will pick you up from your hotel to begin the short bus ride to the gates of Machu Picchu where you may have the opportunity (weather permitting) to enjoy one of the most spectacular sunrises of your life! After entering the Citadel you will begin a guided walking tour (approx. 2 hours), learning about the history of the area and the ruins. Enjoy some free time afterwards to explore this mysterious ancient city at leisure. This afternoon, meet your guide in Aguas Calientes for lunch (not included). Be transferred to the train station and begin the journey back to Cusco via Ollantaytambo. (approx. 3.5 hour train journey). Tonight head to Tunupa Restaurant, located in the central Plaza de Armas of Cusco (a short walk from hotel), and get ready for a fabulous buffet dinner. There is a large selection of typical dishes, meat, fish, vegetables and desserts. The night becomes more enjoyable when the traditional dance show begins and you can get involved with folk, traditional and classical music, and sweeten your ears with the sounds of Andean instruments: Quena, charango, flute, zampoña. If you wish, you can also share the dance floor with the dancers and enjoy a great experience. After breakfast you will be collected from the hotel and transferred to the airport for your onwards flight to Santiago, Chile. Upon arrival you will be met and transferred to the hotel. Enjoy the remainder of the day at leisure. Today begins with the journey towards the centre of Santiago city. During the tour enjoy a panoramic view of the Barrio Bellavista, recognized for its strong bohemian style, along with a visit to the Central Market, a nineteenth century building with more than 214 shops where you can try delicious traditional dishes. The tour continues to Mapocho Station, a cultural centre reconverted in the 90s, which today is a space for the cultural diffusion of the country; and the Museum of Fine Arts (entrance fee not included), one of the main centres of dissemination of visual arts in Chile, founded in 1880, being the first of Latinoamerica. Afterwards enjoy a guided tour of the Cerro Santa Lucia, an urban park located in the heart of the city of Santiago, and then visit the Plaza de Armas, where you can see the Cathedral of Santiago, the town hall, the Central Post Office and the National History Museum. Continue the tour with a panoramic view of the former National Congress and “La Moneda”: the Palace of Government of Chile. Finally, enjoy a scenic drive through modern Santiago to reach the Faba store, which specializes in making jewellery with the Lapis stone which can only be found in Chile and Afghanistan. Afterwards return to the hotel and enjoy the remainder of the day at leisure. Today is free at leisure and a late checkout to 6:00pm will be provided. This afternoon/evening transfer to Santiago Airport for your return flight back to New Zealand departing at approximately midnight. Please note some flights may arrive + 1 days later. Travel offer is valid for travel on selected dates until the 28th May 2020. For solo travellers, a mandatory single supplement of $1620 applies. Latam Airlines, Qantas Airways or Air New Zealand plus any codeshare partners (subject to availability). - Buenos Aires, Argentina (Pre Tour): $145 per room including breakfast. - Santiago, Chile (Post Tour): $200 per room including breakfast. 2 x Twin or 1 x Double/Queen (subject to availability). Minimum group size 6, maximum group size 32 per vehicle. - Recommended gratuities/tipping: $5 USD - $10 USD per person per day where tour or transfer services are provided. Buenos Aires, the capital of Argentina, has a temperate climate, which is classified as a humid subtropical climate under the Köppen climate classification with four distinct seasons. Summers are hot and humid with frequent thunderstorms while winters are cool and drier with frosts that occurs on average twice per year. Spring and fall are transition seasons characterised by changeable weather. Puerto Iguazú has a humid subtropical climate. Temperatures are warm in winter and hot in summer. There is no dry season and rainfall is abundant with every month receiving over 100mm of rain. Rio has a tropical savanna climate that closely borders a tropical monsoon climate according to the Köppen climate classification, and is often characterised by long periods of heavy rain between December and March. In inland areas of the city, temperatures above 40°C are common during the summer, though rarely for long periods, while maximum temperatures above 27°C can occur on a monthly basis. Santiago has a cool semi-arid climate, with Mediterranean patterns: warm dry summers (November to March) with temperatures reaching up to 35°C on the hottest days; winters (June to August) are cool and humid, with cool to cold mornings; typical daily maximum temperatures of 14°C, and low temperatures near 0°C. The precipitation average is 312 mm. Please note: Inoculations may be required to enter the country visited, along with re-entry into New Zealand after your visit. It is your responsibility to consult with your travel doctor for up to date medical travel information well before departure. Gratuities (tips) are not included in the tour price for services of the tour leader (when available) and driver throughout the tour. The recommended tip for the tour leader and driver is $5 USD (approx. $8 NZD) per person per day, which will be collected whilst on tour. The recommended tip at restaurants is 10% extra of the total meal price. A tourist visa for Brazil is not required if travelling on a New Zealand Passport. Passengers must hold a passport valid for at least six months on entry with one blank visa page. A tourist visa for Argentina is not required if travelling on a New Zealand Passport. Passengers must hold a passport valid for at least six months on entry with one blank visa page. A tourist visa for Peru is not required if travelling on a New Zealand Passport. A tourist visa for Chile is not required if travelling on a New Zealand Passport. Passengers must hold a passport valid for at least six months on entry with two blank visa pages. New Zealand tourists are eligible to enter Uruguay without a visa for visits up to 90 days. Visa and other entry and exit conditions (such as currency, customs and quarantine regulations) can change at short notice. Contact the nearest Embassy or Consulate of Uruguay for the most up-to-date information.